If you are completely new to WindowBlinds, let me recommend you also take a read through the WindowBlinds 10 Walkthrough: Changing your Desktop Theme. On most WindowBlinds skins, you’ll see an option to 'modify skin' on the right of the WindowBlinds interface. Clicking that will bring up the options for Color, Transparency, Texture, and Fonts. Clicking one of those expands the section with all the available options for that particular feature. 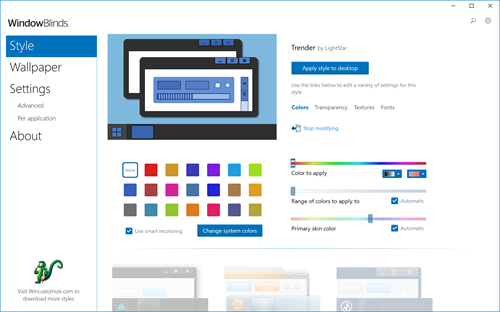 We’ll start out with selecting Color, and that will bring up the coloring options in WindowBlinds. Using this option you can change the color of a WindowBlinds skin by selecting a color and using the sliders to adjust it even further. You can just the brightness and saturation, and there’s also options to adjust the range and primary skin colors. Of course you can also stick with WindowBlinds smart recoloring which will give you excellent results. Note that some skins will accept color changes better than others depending on their design. The last option in the Color tab is for fonts. Here you can override the font that is defined in the skin, and you also have the option to adjust the size of the fonts. 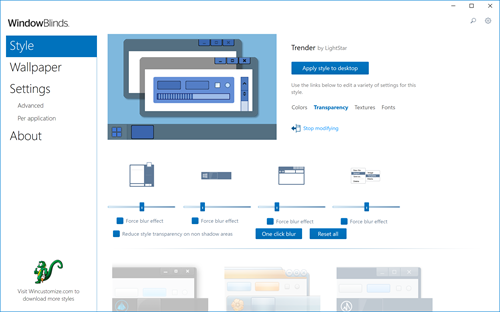 Next we have the Transparency option which gives you the ability to change the transparency of the start menu, task bar, window frames, and context menus. Just adjust the sliders to the amount of transparency you want, and apply the changes to see them in use. 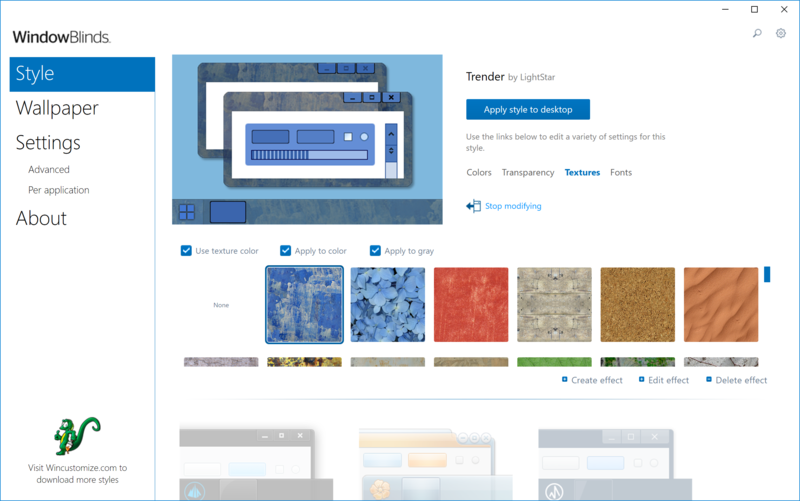 Textures is another feature available in WindowBlinds that gives users the ability to add textures to a WindowBlinds skin. When adding a texture, it can dramatically change the way a skin looks depending on what type of texture image is used. There are a bunch of textures included, and it’s fairly simple to create and add your own so you can customize a skin to your personal liking. We even have a WindowBlinds Texture gallery on WinCustomize.com where people can download textures other people have made and shared. WindowBlinds is available individually for your Windows PC, but you can get that and more with a low-cost membership to Object Desktop. While you're a member, you'll get free updates, access to all betas, and any new apps for one year. You’ll also get access to other great programs like Groupy, Start10, DeskScapes, Fences, Multiplicity, and more! 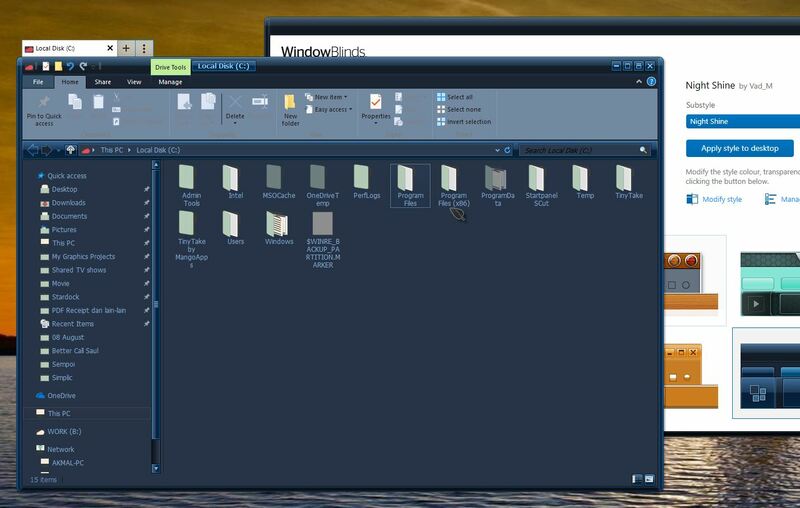 How do you change the "Pin to Quick Access" font color in the WIN10 File Explorer Window? See attached link which is a print screen image of the difficult to read font. What theme are you using on the screenshot? That is strange, nightshine on mine but that "Pin to Quick Access" font is black when active.